FB Purity v23.0.0 has been released and has lots of new options and fixes!!!! Seasons Greetings, FBP Fans! 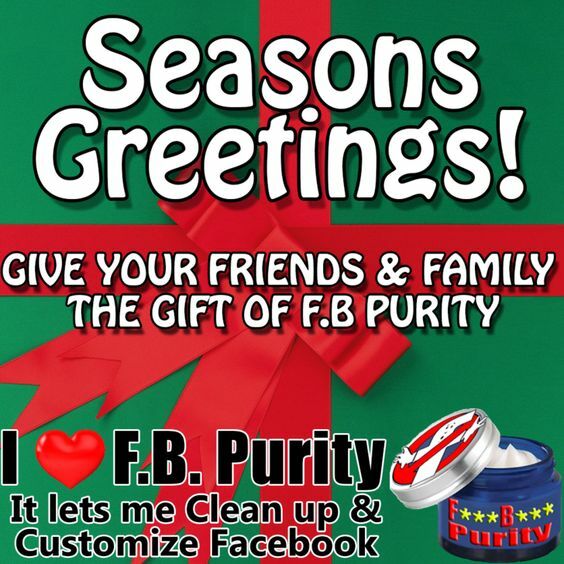 I hope you have a lovely holiday season with your friends and family, I hope you are enjoying using FB Purity. If you have been using FBP for a while, and can afford it, donations are always welcome, heaps of gratitude to those who have donated to the cause already, Cheers! Fixed the “Hide Sponsored Box / Posts” option which wasn’t hiding “Suggested Posts” for some people, it also now also hides a new type of ad which are labeled as “Paid” instead of “Sponsored“. Fixed the “Sort Notifications Chronologically” option. Fixed the “Zap Comments” function that lets you press the “Z” key to hide comments that just consist of tagged (linked) names. Fixed the “Square profile pics” option, located under the “Font, Colour & Design” heading on the FBP options screen. Fixed hide “Watchlist” “Right column link” option. Fixed the style of the “X” (hide newsfeed post) button to make it less intrusive. Fixed the “Show Deactivated Friends” link in the “Deleted Friends Alert” popup. Fixed the “Custom Reactions” functionality, as it had stopped working properly. New “Custom Reactions” image packs: StarTrek – Facebook, Facebook – Moustache, Arnold Schwarzenegger,Top Gear, Grrr, “Animated Pokemon” and “Facebooks standard non animated” reactions sets. New “Remove Comment Bubbles” option (located under the “Font, Color & Design” section of the options screen) that removes the “bubble” style design on comments on posts. New “Hide left column link” options for the following left column links: “Recent Ad Activity“, “Moves” and “Greetings“. New added “Hide Car Photo” to FBP’s photo content filters. New added hiding the “Did you know” box on your Timeline/Profile page to the “Hide Nagging Questions” option. Updated the “Hide Nagging Questions” option to also hide the rotating prompt in the intro section of your profile/timeline page asking you such things as “What makes you happy” etc and also the prompt to add a website link. Updated the “Shared a Memory” newsfeed filter to fix hiding “Year in Review” videos. Updated the hide “Your Memories” option to fix hiding “Your Year in Review“. Added “Suggested Shows” and “Get new episodes in your watchlist” to the “Hide Sponsored Box / Posts” option. Updated the “Transparent Newsfeed” option to make the “Trending” box and Status update box transparent. Added hiding the “Gaming Video” and “Live now in Popular Games” boxes in the right column to the hide “Game/App Requests” right column link option. Added “Places Trending in …” to the hide “Trending Posts” newsfeed filter option. Added “Celebrating Friendship” to the hide “Became Friends” newsfeed filter option. New option to “Hide Text Animations” located under the “Font, Colour & Design” heading, that removes the animations that are displayed if you type things like “xoxo“,”rad“,”lmao“,”bff“,”you got this!” in comments or statuses. Fixed “360 photos” being blank if background colour was set. Removed all “Ticker” related code because facebook has officially completely removed the ticker. This entry was posted in Facebook, FB Purity and tagged animated pokemon reactions, clean up facebook, custom facebook reactions, custom reactions, customise facebook, Customize Facebook, Facebook, facebook purity, FB, FBP, fluff busting purity, hide all facebook ads, hide car photos, hide celebrating friendship, hide facebook ads, hide gaming video, hide greetings, hide left column links, hide live now in popular games, hide messenger kids, hide moves, hide recent ad activity, hide sponsored posts, hide suggested posts, hide suggested shows, hide watchlist, hide year in review, moustache reactions, remove facebook ads, show deactivated friends, sort notificactions chronologically, sort notifications chronologically, star trek reactions, view facebook notifications chronologically, zap comments. Bookmark the permalink. My newsfeed does not wrap. In other words, a sentence in it runs off the right side of the area and I can not read it all. Do you have any suggestions? I could send a screen pic of it by email if that would help. if you have the show full date and time option turned on, that could cause that issue. or the show full URLs on shared links option could also cause that. if you have either of those options turned on, try turning them off. Why is FBP called TamperMonkey in my Safari extensions list? It isn’t. Tampermonkey is a browser extension that lets you run “Greasemonkey” Scripts. You are running FB Purity as a Greasemonkey script via the Tampermonkey extension.